1) With an accent wall: Go for one yellow painted wall instead of drowning your entire room in yellow and making it look over-whelming. If you find doing even one wall yellow a bit too much for your taste, you can always hang a big painting over it to reduce the lively effect. 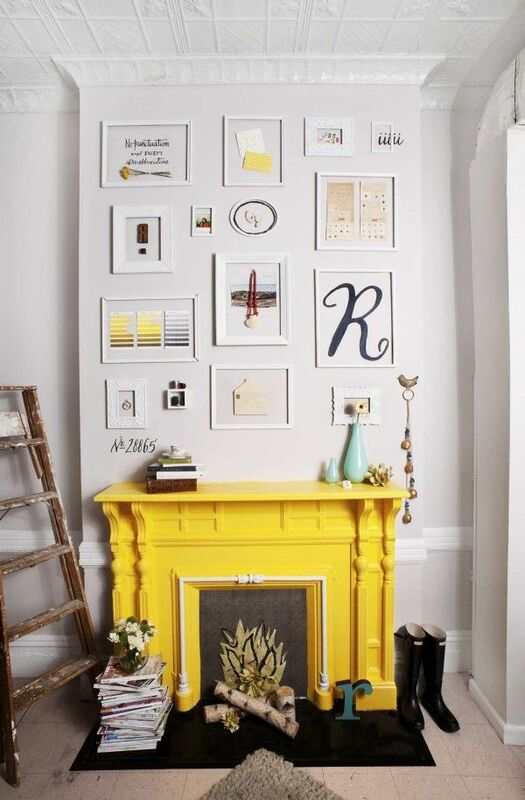 You can even go for patterned yellow walls mixed with elements of white to tame the effect. 2) Statement pieces: Statement pieces are amongst the easiest ways to go for this shade in your home. If you don’t like to experiment too much, it is best that you go for yellow colored statement pieces in the form of table center-pieces, yellow crockery, yellow table or any other piece of yellow furniture. If your home consists more of a cooler palette, ensure that you strike a balance with this warm shade. 3) Welcoming door: How about welcoming your guests by making their entrance through a yellow colored door? The idea itself sounds cheery! You can get your door in this vibrant shade. It’s quite a fun way of adding a change at your entrance. 4) Vibrant furniture: There’s something about the shade Yellow which makes for quietness and comfortableness quotient. Stop relying on sunshine now to bring warmth in your home. 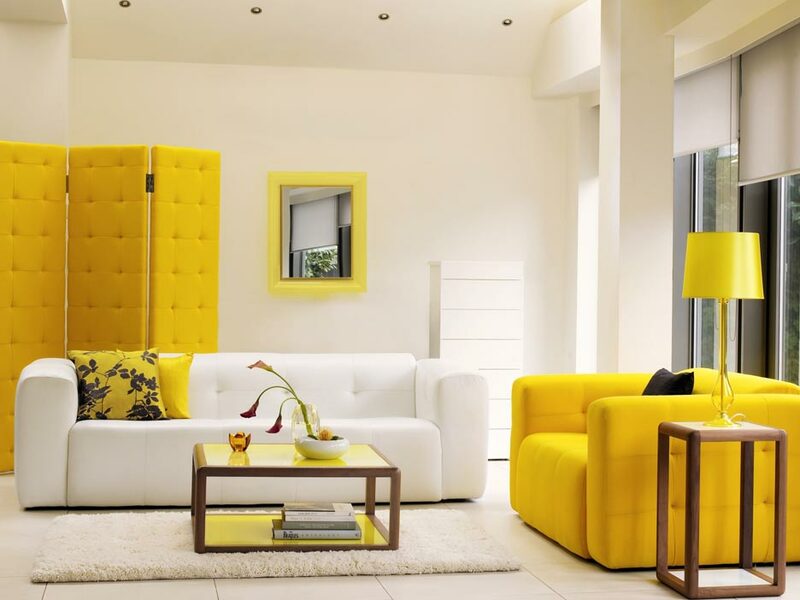 Be a bit daring and cheer everyone entering your home by bringing yellow furniture. The key to balance its brightness is by keeping it in a place painted with light hues like white or gray. 5) Team it up with Blue: Yellow and Blue together are a refreshing combination and they are your sure shot ticket to jazz up your home! Mix and match with accessories, walls, paintings, furniture, rugs or simple statement pieces to create an eye-catching yet not a blinding effect. Shop for your home décor needs without breaking your bank with Fabfurnish coupons via CashKaro.com which will provide you awesome discounts and cash back. 6) Throw some drama: Turn on the heat by going for wall decals and stickers to beautify your walls which are accompanied with fiery quotes and graphics. If you don’t want to go for wall decals, just get some brushes and yellow paint to pour your heart on the wall through texts. 7) Show your calm side: Yellow teamed up with white is the ultimate from of elegance and sophistication. Go for pastel yellow and match it with the tranquil white color. Light up candles or include some mini lighting pieces to add to the serene look. Beautify your home without making your wallet light by using these Pepperfry coupons present on CashKaro.com to enjoy discounts and cash back. 8) Connect it with Black: Go for a contrasting selection by teaming Yellow with Black! It is an unusual but yet a striking combination. While on one side Yellow infuses brightness, Black tames its signal effect. No wonder they make for a remarkable combination! 9) The pastel bandwagon: If Yellow is too attention taking for your eyes, go for pastel Yellow shades which render a soft effect. Pastel Yellow and Pastel Greens make for a delightful combination in a modern themed house. 10) Fresh look with flowers: The easiest way to sport this color in your house is by getting yellow flowers. Blooming summer in shades of yellow makes for a beautiful sight.